With “The Dark Knight Rises” in full force shooting on location in Pittsburgh, we all knew we would get plenty of leaked images of the action. Many were hoping for more looks at Batman and Bane, and most were praying for our first look at Catwoman. Well that is exactly what we get with the studio even releasing an official look at Anne Hatheway as Selina Kyle before the leaked set pics hit the web. Enjoy all of the photos below. Be warned that some may be considered spoilers. This is our first look at Bane in full. I like the military look. Gives him more of a real world mercenary feel that I am sure Nolan is going for. I could not find a photo for proof, but I have heard that what he is holding in his hand is a photo of Harvey Dent. It will be interesting to see how this will play into the story. Maybe Bane is trying to take over the city and reminding everyone that it was Batman who killed their White Knight? I really like this photo because it is fun to speculate exactly what is going on. At his been revealed that Marion Cotillard will be playing Miranda Tate, a Wayne Enterprises employee. So it makes sense that she would have access to a Tumbler prototype just like Bruce did. But why would she need it? I have stated it on this site before that I am confident that Cotillard is secretly Talia al Ghul as well and her costume seems to help my case. Kind of looks like something that Liam Neeson would have worn in “Batman Begins”. 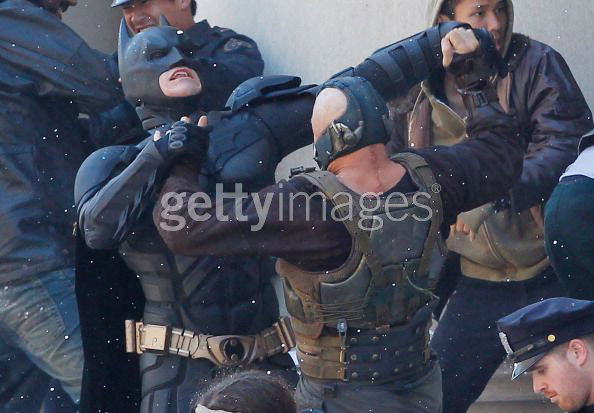 You know this will be just one of the fights the two will engage in during the film. But it is still fun to actually see them fighting. Batman’s suit looks slightly different or maybe it’s just the fact that we are seeing it in broad daylight that it appears different. It appears that the film will take place during the winter with the snow in the air and on steps in other shots. The aspect I am most curious about is that scar on Bane’s spine. My spine definitely does not look like that. Tom Hardy recently spoke about the character, and while none of it is a huge revelation, it is nice to hear how excited he is about getting to play the character. Hardy was then asked about the famous back breaking fight between Bane and Batman in the comics. Let’s start with the costume. 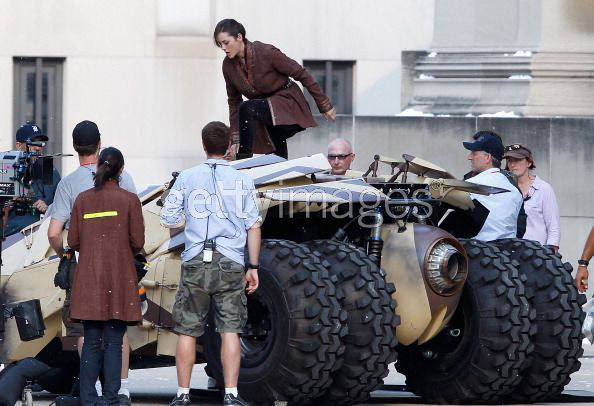 While we don’t get a great look at it here, below I have provided images of the stunt double where you get a full body look at what she is wearing. It is definitely what I was expecting. Black leather cat suit similar to what has been seen in the comics lately. I am surprised at the glasses. My brother suspects they may be Wayne Tech which is very possible. I guess I am most shocked that she does not appear to be too concerned about concealing her identity. One website posted that she was on a motorcyle. Seriously?! How can you not see that she is on the Bat-Pod? Are Batman and Catwoman allies sharing all the same resources? Obviously all of these photos come from the same sequence. So exactly where does this take place within the film? My guess is pretty late in the game. Maybe the end of the second act. Miranda Tate is finally revealed to be Talia who is in control of Bane and all of his henchman. Catwoman and Batman decide that it would be mutually beneficial to team up and take down Bane. What do you think? Let me know in the comments below.